GRIP&SHOOT released their first product, the Smart Grip, 4 years ago and changed the way people take photos/video with their phones. It was great that you were able to use your phone to record videos while still holding your phone comfortably but you weren't able to attach any lights or microphones. 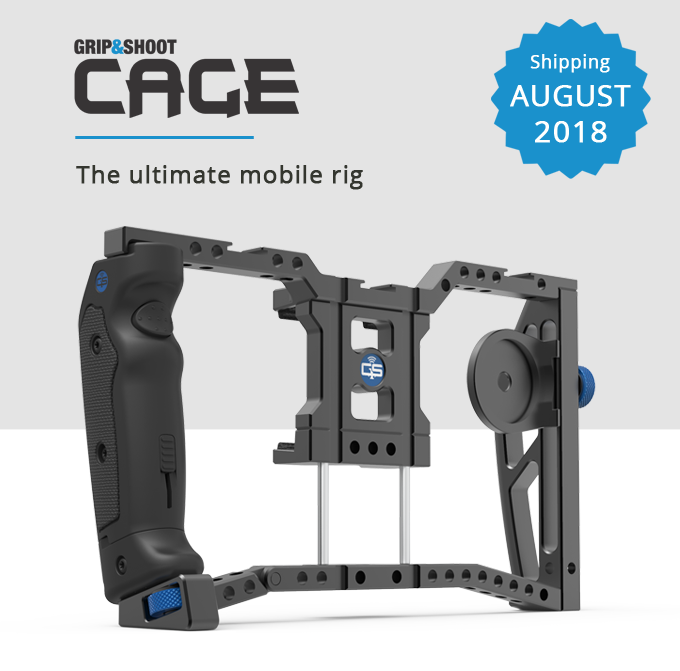 GRIP&SHOOT has released a solution, the CAGE, on Kickstarter. 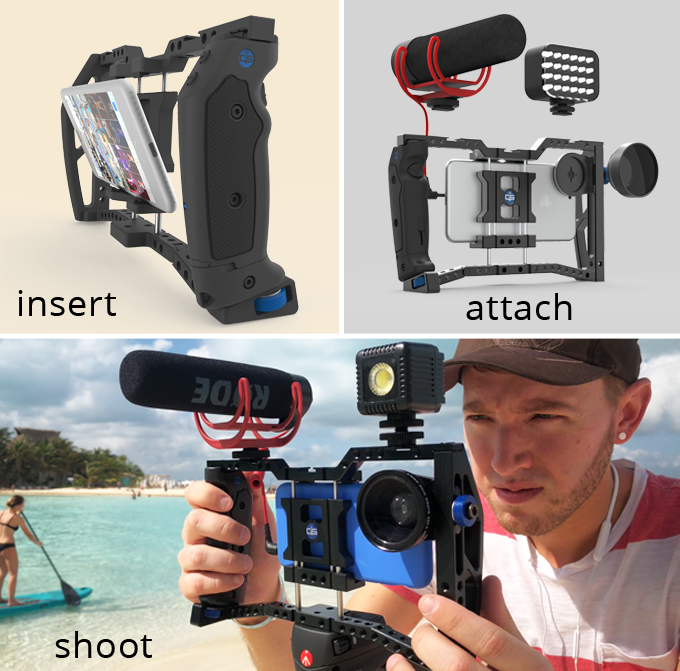 CAGE is a professional rig that wirelessly controls your device and allows you to add essential accessories to bring your media to the next level. Kickstarter campaign ends May 31, 2018 and ships Summer 2018. If you're a previous owner of the Smart Grip, pledge starts at $175 for the cage only (Legacy). $205 gets you the cage and two basic grips (Basic). There are other options as well but if you want to full package (Pro-Lens) for $315, you get the cage, a basic grip, Smart Grip and lens adapter. Your phone is great for fitting in your pocket, but not so great for holding out in front of you for long periods of time. It’s thin, slippery, and doesn’t do too well when dropped on cement. CAGE’s ergonomic frame is made from tough aircraft aluminum. It provides comfort, stability, and protection when shooting on location. With a span of 3.5”, CAGE is able to accommodate even the largest smartphones (with or without their cases). A standard ¼-20 mount on the bottom of the frame means that you can go from hand-held to tripod in seconds. Upgrade the quality of your media by taking advantage of CAGE’s three cold-shoe mounts. Attach microphones, top handles, lights, monitors, arms, teleprompter, everything you need to achieve professional production quality. The 37mm Lens Adapter allows more creativity per project. Customize your shot by adding wide angle, telephoto, anamorphic, or fisheye lenses. The perfect lens can change the look of your media from good to great. Lens from Moment, Olloclip, etc. are compatible. Want full control at your fingertips? The optional CAGE’s Bluetooth Smart Grip allows you to control your phone without ever touching it. Using the free GRIP&SHOOT App (or other compatible Apps), you’re able to capture, zoom, expose, toggle video modes, and more via 3 Bluetooth buttons positioned exactly where you need them. For a little more freedom, you can easily detach the Grip from your rig and use it as a remote to control your device over 100ft away. Get in the shot, be your own camera crew, and take full control of your media without ever touching your screen.